Want to push some serious air? 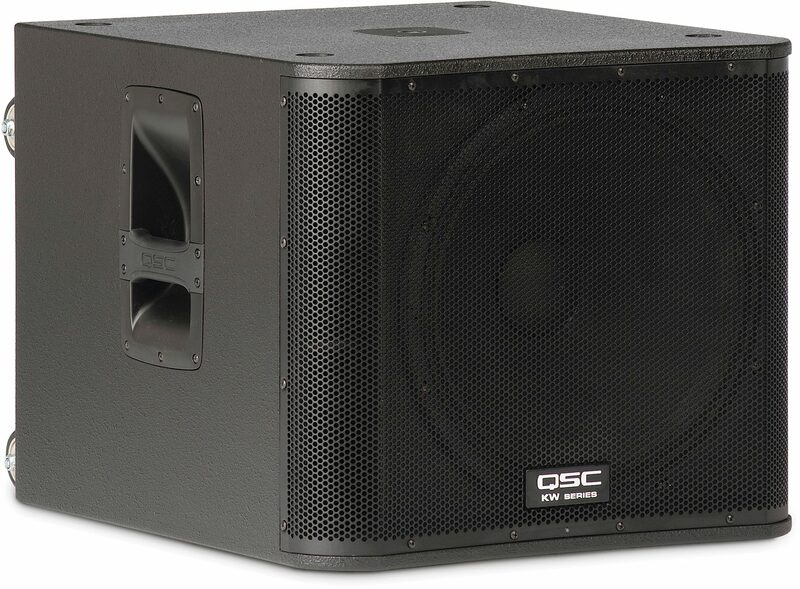 With 1000 watts continuous and 2000 watts peak power handling, the QWC KW181 is a seriously powerful subwoofer. Like its QSC KW series siblings, the powered KW181 boasts a machined birch plywood cabinet, aluminum handles, a strong steel grille, and casters that make it easy to move -- so you can get the dance floor moving faster. Integrated M10 suspension points make the KW181 ideal for flying, while its threaded pole-mount cup provides a wobble-free connection with the included threaded speaker pole. 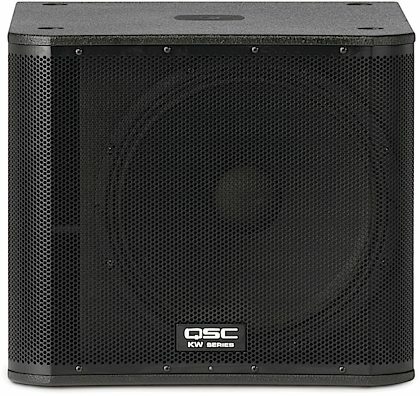 As part of QSC's robust KW series, the KW181 sub is a powered, active speaker with 1000 watts of lightweight Class D amplification. This sub's built-in Class D power amp employs QSC's Guardrail limiter to prevent destructive clipping distortion and speaker cone over-excursion, while a virtually silent internal fan turns on when the amp senses high temperatures -- making the KW181 truly robust. To build a subwoofer that performs equally well across the entire sound field, QSC took dozens of measurements and implemented FIR linear phase filters that adjust the speaker's frequency response, helping deliver consistent sound over the entire audience. 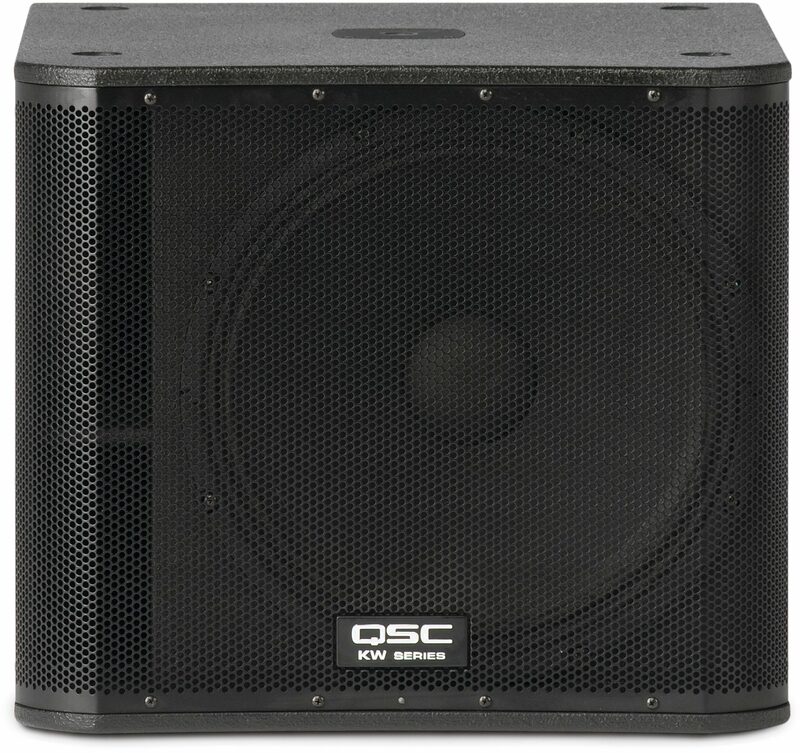 To get impressive bass output from 1000 watts, the KW181 subwoofer has QSC's proprietary DEEP: Digital Extension and Excursion Processing. Flip the DEEP switch on the back of your sub, and a virtually transparent limiter kicks in to increase the average output of bass frequencies. 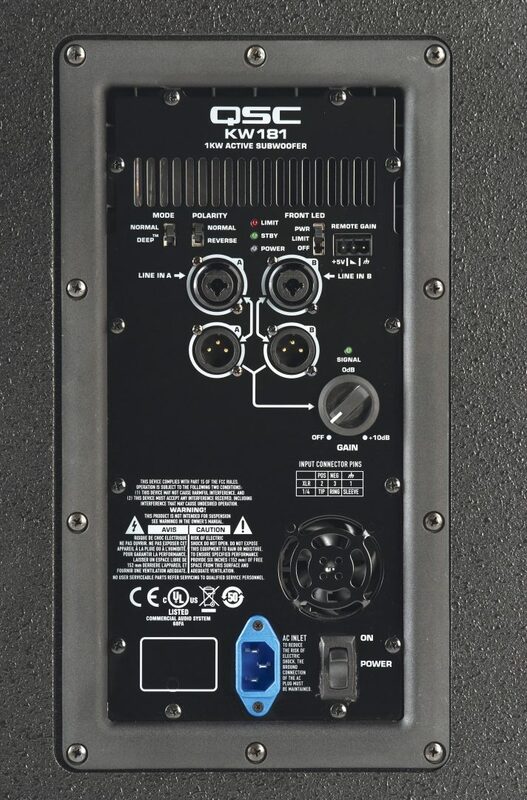 Much more than just a low-frequency EQ boost, DEEP mode employs sophisticated DSP to detect and correct any brief bass transients that could cause clipping distortion or over-excursion of the 18-inch woofer -- helping the KW181 to safely pump out frequencies as low as 43 Hz, with a maximum SPL of 132 dB. - Front LED modes: POWER illuminates when the unit is powered on, OFF disables the LED, and LIMIT mode illuminates when the clip-limiter circuit is engaged. Building on the success of QSC's K Series, the KW181 represents the next evolutionary step in wood enclosure loudspeakers. QSC system engineers have created the KW181 to feature all the groundbreaking electronic attributes of QSC's popular K Series while at the same time designing a product that is both smaller and significantly lighter than previous wood enclosure models. - Intrinsic Correction, first featured in QSC's high-end line array products, maps 65-75 spatially-averaged measurements to IIR and FIR filters that actively adjust time, frequency and amplitude response to a maximally flat bandpass target. The result is a speaker that behaves equally well across the entire sound field. - DEEP and excursion limiting allow for extended low-frequency response by actively managing low-frequency transients without degradation of the underlying signal or adjacent frequencies. - GuardRail(tm) protection. first introduced on QSC GX Series amplifiers, protects both the amplifier module and your performance from unnatural and destructive clipping. The KW181 is designed to withstand the rigors of professional use. Advanced construction processes, premium-grade Baltic birch cabinetry, ergonomic, cast aluminum handles, low-noise casters and a highly protective steel grille provide for ease of transport and long term durability. Integrated M10 suspension points allow for flown applications with a KW M10 KIT (sold separately) and a threaded pole receptacle provides for a positive, wobble free connection to a threaded speaker pole (included). On the rear of the KW181 sub, combo XLR and 1/4" TRS inputs accept line-level input. The DEEP switch can be set to NORM or DEEP(tm) for additional bass extension. The rear panel LED switch can be set to POWER, illuminating the front-mounted LED when the unit is powered on, OFF for applications where it is not desirable to illuminate the front LED, or LIMIT which indicates to the system operator that the clip limiter circuit has been engaged during operation. Remote gain control capability is offered via a potentiometer (not included) connected to the onboard Phoenix-Style connector. In an installed application, multiple KW181 speakers can be "daisy-chained" for total gain control from a single remote pot. Auto-standby mode is engaged after 5 minutes of inactivity. Overall: I'm a mobile Dj and I was looking for a sub to make my Mackie Thumps sound better. I didn't want an okay sub though. I wanted a great sound quality as well. Then I heard the QSC KW181. OMG! This thing sounds like the Bugatti of subs!!! PLUS, it has wheels attached for extra ease with transport. Even though this sub can easily fill a room 3000 square feet, I'm waiting to buy another. Hands down best purchase this year.